Many fisherman, after catching a noteworthy fish, will take a quick picture before letting it go. A picture serves as proof of the catch, as well as something to look back on and remember all the fun that was had on the water. 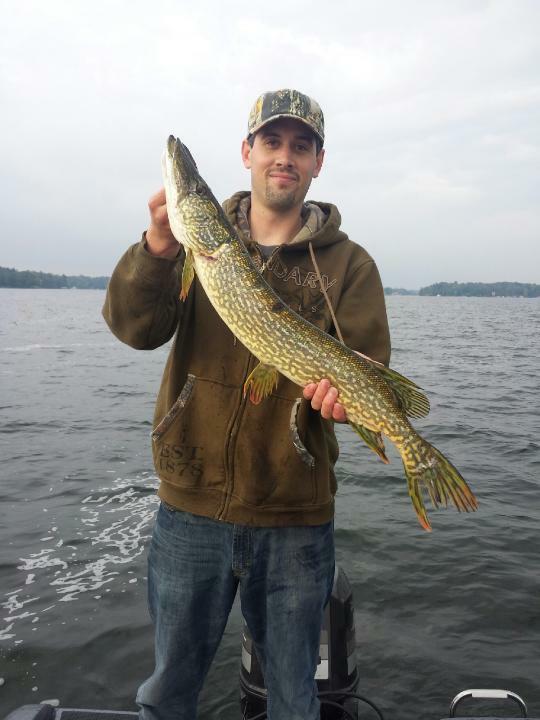 Here’s a fair sized northern pike I caught on Lake Okauchee this last fall. There are a couple of ways a fisherman can make sure the picture does justice to the true size of the fish (meaning make it look bigger 😉). Since a camera only has a single point of view, if you hold the fish out toward the camera and try to keep your hands behind the fish, it’ll look bigger since it’s closer to the camera. Another way is to widen the view and lower the angle of the camera. Changing the way the camera views the fisherman and fish can give a different perspective that enhances your claim on being a good fisherman. In SQL Server, the PIVOT function can be used to change the way data is presented, and make it more usable to those that need the results. 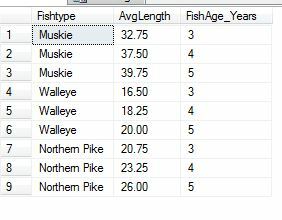 It’s now quite easy to look down the columns and see that, at four years old, the Muskie is about 14 inches longer than the Northern Pike and almost 20 inches longer than the Walleye. Let’s take a look at the syntax of the PIVOT function because, in my opinion, it’s somewhat confusing. The first part is SELECTing the fields. You can select any of the non-pivoted fields (in this case, Fishtype). Then you can select any or all of the fields that you are pivoting on. 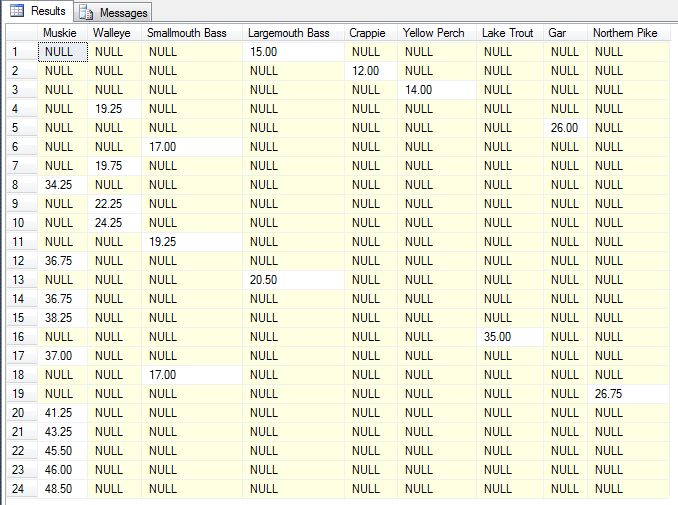 In this example I have aliased the , , and  fields to make it more obvious what data is being displayed. The next part is the pivot function and the aggregate function. You always have to include an aggregate function, even if you don’t need to see it in your result set. Lastly, you include the field whose values you want to be the new columns, and include each value that you want. You also have to create an alias for the pivot sub-table. The results let us see how we’ve done each month. October seems to be the time to hook up with some big muskie! I hope this post has given you a good idea of how to use the PIVOT function, and times when it may be a good idea.